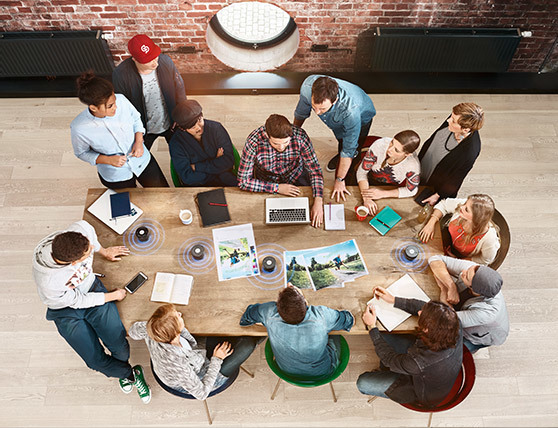 Sennheiser offers the first portable wireless conference system for online meetings – TeamConnect Wireless. It’s a turnkey audio solution that is exceptionally easy to set up and use. The system can be set up in less than a minute so any user can host a professional-sounding online meeting for up to 12 or up to 24 people in an instant in any room. TeamConnect Wireless supports all Unified Communications requirements for online meetings and offers multiple connectivity options. Users can quickly connect with any laptop or smart device – wirelessly via NFC enabled Bluetooth or via USB/3.5mm jack wired connections. TeamConnect Wireless also supports multiple simultaneous audio channels, so joining additional callers to an ongoing online meeting is easy, too. Sennheiser TeamConnect Wireless comes in different versions in order to provide just the right amount of flexibility your business requires. The system is availlable in stationary tray-set versions for dedicated meeting rooms with 2 satellites for up to 12 participants or 4 satellites for up to 24 participants. Also, there’s a portable case-set version for flexible meeting rooms with up to 24 participants. The durable and stylish transport case doubles as charging station for the four satellites. TeamConnect Wireless delivers best speech intelligibility and top quality audio for more efficient online meetings. The system looks every bit as high-end as it sounds: the system’s master unit intuitive touch sensitive glass control panel lets you connect and control online meetings with ease and style. TeamConnect Wireless brings high-end German built quality and award-winning design into the meeting room!